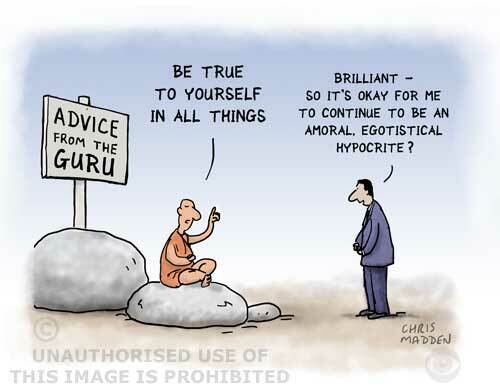 The illustration shows a guru dispensing advice to ‘Be true to yourself in all things’. The cartoon highlights the absurdity of the expression ‘To thine own self be true’, as the expression can be taken as a license for people to do whatever they want. The expression only makes sense if you assume that everyone’s nature is essentially good. “To thine own self be true” is a quote from Shakespeare (by Polonius in Hamlet). The image is a criticism of philosophies and lifestyles that take concepts of self fulfilment or self actualisation to an extreme, and or the concept that it’s morally good to follow the impulses of your own personality without self-restraint.